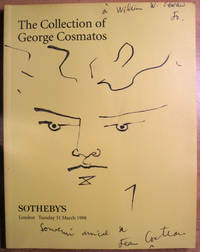 New York: Christie's, 2002. 224 pp. 132 items. A ding to the bottom fore edge corner, lightly visible as a shallow bend on pp. 1-40. A small bump to top fore edge corner, else fine. Lushly illustrated, every item illustrated, many with full-page color, plus extra illustrations inside and outside front and back covers. . Illustrated Wraps. Very Good. 4to - over 9¾" - 12" tall. 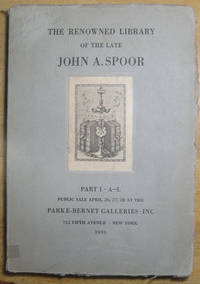 New York: Parke-Bernet Galleries, 1950. 80 pp. 404 lots. Edges of wraps with wear and soiling, a light stain to fore edge, else fine. Lots 64 to 293 are devoted to Robert Frost. Reproduced herein: Inscription by Robert Frost in the unique copy of his first book; Inscription of L. Frank Baum, Chicago 1900, autograph copy of the poem, The Pasture, signed Robert Frost; and more. 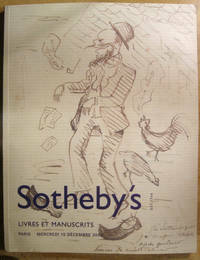 Other lots include Eugene Field, F. Scott Fitzgerald, and James Whitcomb Riley. . Wraps. Good. 8vo - over 7¾" - 9¾" tall. 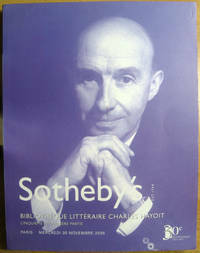 Paris: Sotheby's Paris, 2005. 240 pp. 230 lots. Ex Lib. 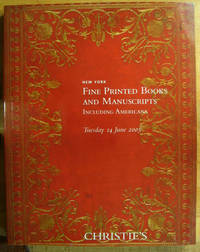 premier American rare book library. Library pocket inside front wraps containing prices realized. Stamp of library and acquisition date on TOC page. Light bumping to corners, evidence of dampness on rear bottom corner not visible on wraps, extending only into Sotheby's boilerplate. P.O. 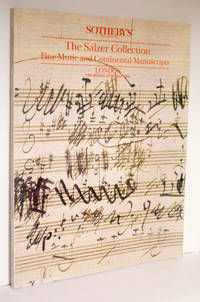 has annotated a few lots in ink. Still looks good, with all its faults. 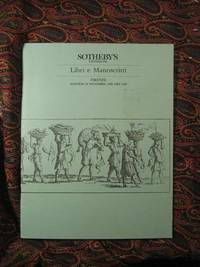 Livres Anciens, Lots 1-21; Livres du XIXe siecle, Lots 22-173; Livres du Xe siecle, 174-230. . Illustrated Wraps. Good. 4to - over 9¾" - 12" tall. 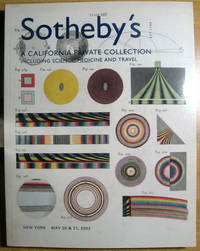 Florence, Italy: Sotheby's, 1989. unpag. Lots 1001-1327. Sticker shadow on front, otherwise fine. Josephus Flavius; Klauber, Historiae biblicae veteris et novi testamenti; Chagall-Malraux, Et sur le terre, one of 25; Capoferro, Gran simulacro dell'arte, e del-l'uso della scherma, Siena, 1610; and more.. Illustrated Wraps. Very Good. 4to - over 9¾" - 12" tall. San Francisco, CA: California Book Auction Co., 1977. unpag. 641 items. 16 pp. illus., front and back of wrapper illustrated. Prices realized included. Bumping to corners, soiling, a small catalog sticker at bottom of spine. Inside unmarked. Lots 1-108: Daguerreotypes, Ambrotypes, Miniature Cases; Lots 109-146: Cartes-de-Visite, Cabinet Cards, Tintypes; Lots 147-214: Albums and Books with Original Photographs; Lots 250-354: Nineteenth Century Photographs; Lots 355-456: Stereographic Views; Lots 457-499F: Books, Historical, Glass Slides, Equipment; Lots 500-641: Twentieth Century Photographs.. Illustrated Wraps. Very Good-. 8vo - over 7¾" - 9¾" tall. 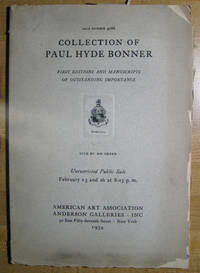 New York: American Art Association Anderson Galleries, Inc., 1934. 67 pp. 286 lots. Chipping and soiling to wraps, else very good. ''Blake's Visions of the Daughters of Albion and the autograph manuscript of Genesis; Boswell's Life of Samuel Johnson with a leaf of the original autograph ms.; Lamb's Essays of Elia: Presentation copy to John Clare; corrected proof sheets of Lawrence's Seven Pillars of Wisdom; First Editions of Keats' Poems & Poe's Poems; and other outstandingly important first editions and manuscripts.'' B&W frontis, TP Visions of the Daughters of Albion ''plates superbly finished by William Blake in opaque pigments and watercolor [Number 11].'' Also, ms. pp. 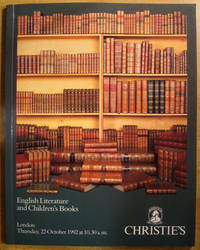 of TE Shaw and Boswell reproduced.. Wraps. Good. 8vo - over 7¾" - 9¾" tall. 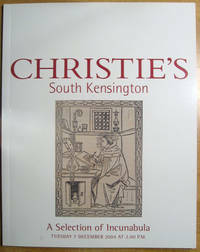 South Kensington: Christie's, South Kensington, 2002. 64 pp. 219 lots. 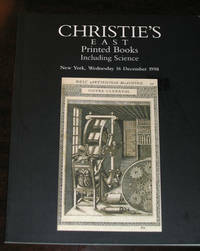 Lots 1-45: Art reference and modern illustrated books; 46-61: Maps and atlases; 62-115: Travel and natural history books; 116-176: Continental books, including incunabula; 177-219: English books. . Wraps. Very Good. 4to - over 9¾" - 12" tall. 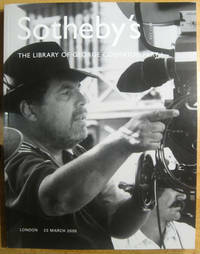 New York: Sotheby's New York, 1999. 392 pp. 462 lots. Light bumping to corners, otherwise fine. Fine Manuscript and Printed Americana (lots 1-162 including a letter to Rhode Island Governor William Greene dated 2 June 1781, signed by George Washington, which sold for $34,500); Modern Illustrated Books and Fine Bindings (lots 163-196 including Longus Daphnis & Chloe. Paris: Teriade, 1961, with 42 colored plates by Marc Chagall, binding by Paul Bonet. ); A Selection of Fruit Books from the Library of Robert A. Nitschke (197-206 including a rare example of a ''tree peddler's'' specimen book, typical of those produced in Rochester, New York during the second half of the nineteenth century, which sold for $5,462); Property from the Botanical Library of Earl L. Murphy, M.D. 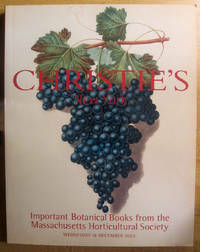 (lots 247-267 including first edition of one of the earlist lithographed botanical books, limited to one hundred and fifty copies, which sold for $17,250. ); Property of a Long Island Nurseryman (268-287 including John Parkinson Paradisi in sole paradisus terrestris. London: Humfrey Lownes & Robert Young, 1629, the earlist inportant treatise on horticulture published in England, which sold for $10,925. ); Natural History and Travel (lots 288-314 including Thomas L, McKenney and James Hall History of the Indian Tribes of North America, with Biographical Sketches and Anecdotes of the Principal Chiefs. Philadephia: 1833-44, with 117 handcolored lithographed portrait plates, which sold for $85,000. 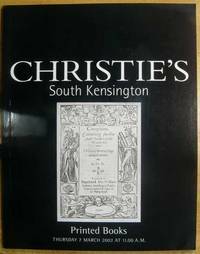 ); Fine Books and Manuscripts (lots 315-462 including Louis Armstrong, Jane Austen, Bemelmans, Boswell, Byron, Casals, Churchill, Dali, Dickens, Disraeli, Edison, Euclid, Euler, Freud, Frost, Buckminster Fuller, Robert Fulton, Galileo, Gauguin, Gershwin, William Godwin, Goethe, Gorey, Graham Greene, Zane Grey, Hawthorne, Heine, Hemingway, Alfred Jarry, Samuel Johnson, Melville, Mendelssohn, Milne, Margaret Mitchell, Marilyn Monroe, Perse, Picasso, Cole Porter, Puccini, Rousseau, Salinger, Shelley, Spenser, Stalin, Thackeray, Verlaine.). Also property from a Maryland family, Estate of Margaret Ormandy (wife of Eugene Ormandy), Press Secretary of the British Embassy, W. Cassell, Greater Vernon Museum and Archives, and Mrs. Joyce Maynard (Fourteen als from J.D. 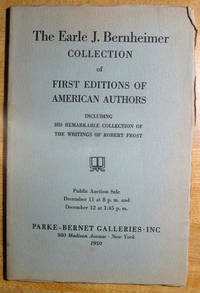 Salinger and the ms. of her first book, the lot sold for $156,500).. Illustrated Wraps. Very Good. 4to - over 9¾" - 12" tall.